In the pharmaceutical industry, continuous processing techniques give productivity and product quality improvements over traditional batch processing alternatives. 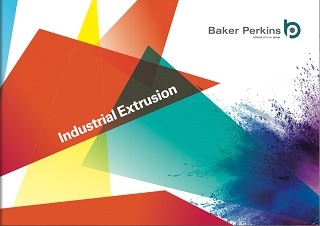 Baker Perkins' MPX extruder range has been specially designed to meet the specialist needs of the pharmaceutical industry. Constructed in wear-resistant stainless steel, according to cGMP guidelines, the MPX is suitable for the extrusion of many pharmaceutical compounds. Extruders are available in a range of sizes, from bench-top models - suitable for processing batches of a few hundred grams - to large scale production units with capacities of several hundred kilograms per hour. Wet granulation is a common technique for preparation of free-flowing porous granules, which are readily compressed into tablets. The MPX range is suitable for the wet granulation of many pharmaceutical compounds. Continuous wet granulation combines solid components and binding liquids inside the extruder. The granules formed can then be dried in a continuous dryer. Production of spheroids by extrusion spheronisation is widely used in the manufacture of controlled-release dosage forms. The particles formed are smooth surfaced, round and exhibit a narrow and reproducible size distribution. The density and friability of such particles are also well defined. These characteristics result in the particles being easily and uniformly coated and lead to well defined dissolution profiles. In addition to the the pharmacokinetic properties of the microspheres, the regular beads exhibit excellent flow properties and are able to be accurately filled into hard gelatin capsules. High drug loadings are necessary to achieve sustained blood levels of active pharmaceutical over an extended time period. Drug loadings of 60-85% in a polymeric matrix are possible with the use of extrusion spheronisation techniques. 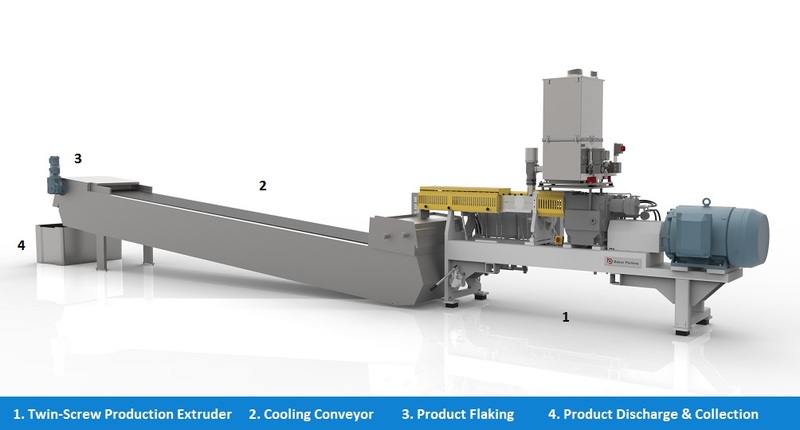 Using Baker Perkins' MPX twin screw extruder allows the combination of the wet massing and extrusion stages into a single unit. The dry powder blend is fed to the extruder, where it is mixed with a liquid binder. The resulting wet mass is then extruded through a die plate to form 'noodles' before spheronisation. Production of controlled release formulations by extrusion spheronisation usually involves an energy-intensive drying stage. When the active ingredient is sufficiently thermally stable to permit compounding into a molten binder, then production by this route eliminates the drying stage. The mixer is electrically heated to promote melting of the binder without excessive mechanical energy input. The molten mass can be extruded onto a cooling band or roller to form a flaked product. This can then be ground to a free-flowing powder for tableting or filling to capsules.